I first heard of this story by Jeremy Clay on the BBC here. The English aeronaut Henry Tracey Coxwell became a minor celebrity in 1862 from a feat of derring-do. 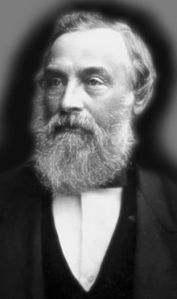 He and the meteorologist Dr James Glashier decided to carry out an experiment on behalf of the British Association for the Advancement of Science to investigate conditions of the upper atmosphere. In short, they were going to take a hot air balloon (which, technically, at that time was not full of hot air–they used hydrogen at this period) up as high as they could go, just to see what happened. Coxwell and Glashier reached the highest point anyone had ever flown by this point–they were estimated to have reached somewhere between 35,000 and 37,000 feet. 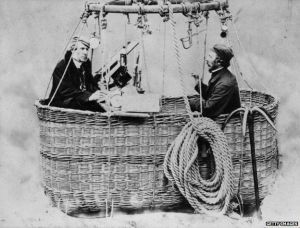 Coxwell and Glashier before their record-breaking flight. Previous Post The Victorians vs. The Victorian Slum: How the narrative structure of a documentary effects our perception of the past.